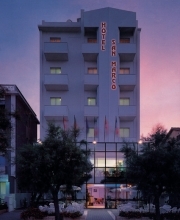 The San Marco Hotel is settled in a wonderful location. 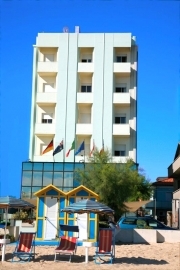 Just 1.5 km from the local railway station and 3km from the closest A-14 highway exit (Marotta), the hotel is located right in front of the sea allowing you to spend your vacation very close by everything you may need. Your holiday is our job and your smile is our satisfaction. That is the reason why at the San Marco Hotel we keep on trying our best in order to satisfy all types of guests, both the restless and the laziest ones. The soft music seems the ideal soundtrack in the smart and wide lobby which is a nice mix of elegance and courtesy, our aces in the hole in order to make you feel better and better. 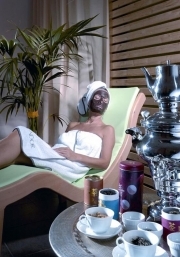 The hotel staff is indeed at your complete disposal for any kind of service and information. Our well-equipped bar is the right place to taste a nice drink, alcoholic or not, the best medicine to ease the typical summer heat. The air-conditioned and newly restored restaurant is on the first floor allowing our guests to have their meal in front of the Adriatic sea, a staggering landscape that will take your breath away. The wine list has been strictly selected to match as better as possible our food specialities. In our canteen you will therefore find either white and red wines, sparkling and even a small champagne niche. Everything is aimed to highlight the typical Marches recipes. The food is something we do care a lot of. You can choose between 2 or 3 different types of first and main courses, both meat and fish (most of all coming from “our” Adriatic sea). Moreover, an outstanding breakfast and lunch buffet (on the one hand pastry, different types of bread, jams, snacks, fruit juices, on the other hand cold and hot vegetables, typical snacks, cakes and sweets etc.). Our dinners are aimed both to the quality and to the quantity, in order to satisfy even the most demanding guest. As we have previously said, our recipes are typical of this area, the local and well-known fish and the real guest star of the town: “I Garagoi”. This slang term defines a typical species of shellfish which looks like an ordinary sea slug a part from its specific two-points opening. After cutting the tip and cleaning, they are cooked and mixed to a special kind of sauce made of olive oil, wine, tomato and several herbs. This is a traditional recipe which has been handed down in the same way for ages in order not to change at all the taste of the original seafaring cuisine. Every year, at the end of April there is also a festival which is dedicated to this weird shellfish, the so called “Sagra dei Garagoi”… something that a real gourmet would never miss! All our rooms have a sea-sight balcony and are well-equipped with air conditioned, air fan, private shower bathroom, telephone, TV, hair-dryer and any kind of comfort. The hotel also has a lift.